APC slams Sagay, calls him rogue elephant – Royal Times of Nigeria. 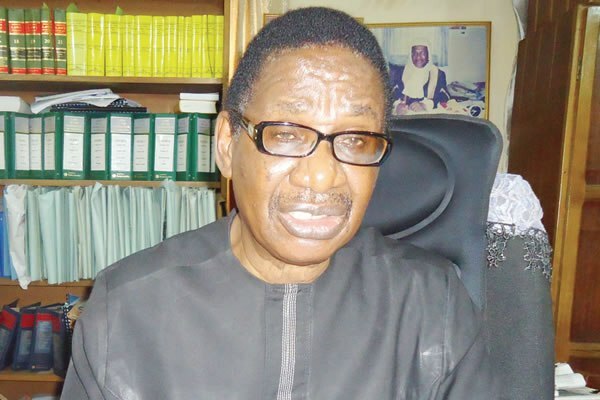 The All Progressives Congress has hit the Chairman of the Presidential Advisory Committee on Anti-corruption, Professor Itse Sagay (SAN), over his statement in a recent newspaper interview accusing the party’s leaders of being a bunch of unprincipled people, encouraging and accepting rogues into the party. It could be recalled that Sagay had also had several verbal squabbles with the National Assembly members, especially senators, asking them to jettison ‘distinguished’, which prefixed their title of Senators and has vowed to continue to criticise them for ‘bleeding’ the nation dry. The party in a reaction issued by publicity secretary, Bolaji Abdullahi called Sagay, a professor of constitutional law, a ‘rogue elephant,”. The statement reads, “Our attention has been brought to an interview published on pages 46-47 of The Nation Newspaper of Sunday, September 24, 2017, granted by the Chairman of the Presidential Advisory Committee on Anti-corruption, Professor Itse Sagay (SAN). “The Webster dictionary defines ‘rogue elephant’ as “one whose behaviour resembles that of a rogue elephant in being aberrant or independent.” Clearly if we have today, anyone in our government or, by extension, the party who feels accountable only to his own ego; who does not feel the need to bridle his tongue for the sake of anything that is higher than himself; who feels independent of everyone and every institution; that person is Professor Sagay. “Asked by the interviewer if he would stop speaking if the President asks him to stop speaking, he said: “Yes, he is my employer. If he tells me to stop talking, I’ll stop talking. But I have certain rights too that I can exercise in addition to that, because I’m not going to be in a position where I am impotent. So, I must obey him, but I can go beyond that and obey myself too. That’s it.” Framed in another way, what Sagay is saying here is that, no matter what is at stake, he would rather resign than obey the President if the President tries to restrain him. This is the quintessential rogue elephant behaviour. “In his sheer arrogance, he forgets that it is impossible for him to call out the leadership of the party as “weak” and “unprincipled” without indicting the President, who is the leader of the party and has the fundamental responsibility to build the party. If Sagay had any iota of respect for the man who dug him back from inevitable oblivion and puts him in a position in which he now feels superior to everyone, he would channel his opinions and advice to the President on how to make the party stronger and more principled. It appears however that Sagay does not have anything constructive to say about anything. He only knows how to tear down and assault everyone and everything.